Richard, Duke of York, advanced his claim to the crown by hereditary right. Parliament granted York extraordinary executive powers to protect the realm, and made him Prince of Wales and Lord Protector of England. With the king effectively in custody, York and Warwick were the de facto rulers of the country. While this was happening, the Lancastrian loyalists were rallying and arming in the north of England. Faced with the threat of attack from the Percys, and with Margaret of Anjou trying to gain the support of the new king James III of Scotland, York, Salisbury and York's second son Edmund, Earl of Rutland, headed north. They arrived at York's stronghold of Sandal Castle on 21 December to find the situation bad and getting worse. Forces loyal to Henry controlled the city of York, and nearby Pontefract Castle was also in hostile hands. On 30 December, York and his forces sortied from Sandal Castle. Their reasons for doing so are not clear; they were variously claimed to be a result of deception by the Lancastrian forces, or treachery, or simple rashness on York's part. The larger Lancastrian force destroyed York's army in the resulting Battle of Wakefield. 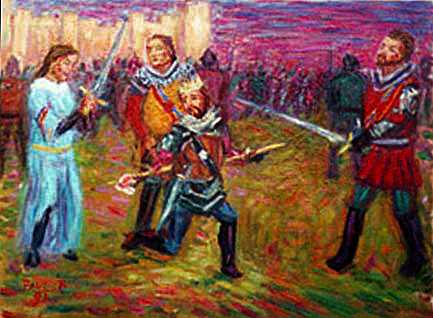 York was crowned with a paper crown and killed kneeling on a molehill by Margaret in the battle. York was buried at Pontefract, but his head was put on a pike by the victorious Lancastrian armies and displayed over Micklegate Bar at York, wearing the paper crown. PaulB's Pointillistic/Impressionist original oil paintings of Classical Figure and various prints and poster formats of a wide variety of subject matter by the Pointillistic/Impressionist oil painter from landscape/waterscape paintings, dance, sports, portrait, to classical figures, flowers, rock and roll, Brazil, and Classical Figure paintings and prints are available for purchase for as little as $24.95 for an 8" x 10" matted print on photo pape. Pointillistic/Impressionist Giclee prints of Classical Figure on real canvas or heavy watercolor paper are available. One of a kind Classical Figurean embellished prints, which are Giclee prints retouched in genuine oil paint by PaulB. Unless noted PaulB's original Pointillistic/Impressionist oil paintiings are oil on canvas. Paul Berenson's pointillistic/Impressionist oil paintings are in privale collections around the world, including the downtown Los Angeles Athletic Club and have appeared in numerous publications, including the New York Philharmonic Playbill. PaulB.com also builds websites and PaulB is a member of the LA Web Professionals Group.